Although Ole and I love salmon (and eat it many times a week), we also enjoy variety and home-cooked meals made using the freshest ingredients. Microwaved or canned foods are not for us! This forced me to find or create recipes for great meals that I could prepare quickly on our oil stove and in our tiny oven while at sea. It was a challenge I readily accepted and this was the genesis of my first cookbook – Alaskan Rock’n Galley. Since then I have literally turned out thousands of seafood and everyday meals in our boat’s little galley and tiny oil stove. My second book, Salmon, Desserts & Friends focused on the dazzling flavors of salmon. But that still left many favorite non-salmon recipes I was dying to share. Hence was born my latest creation, My Tiny Alaskan Oven. The two must haves of all my recipes are: a short ingredient list and minimal prep time. The recipes in My Tiny Alaskan Oven were specifically created to be made with minimal equipment, easy-to-find ingredients and be a breeze to clean up afterwards. The one thing they are not is boring. You’ll find scrumptious, inventive dishes such as Bacon Wrapped Halibut, Seared Scallops with Teriyaki Salad, Pumpkin Doughnuts, Grilled Lamb Chops with Blueberry Rosemary Sauce and Coconut Shrimp with Green Goddess Dip. These recipes are tried and true, suitable for cooking in small spaces or in grand kitchens with all the greatest appliances, and convenient for busy moms and busy people on the go. I hope you’ll enjoy trying them as much as I did creating them. 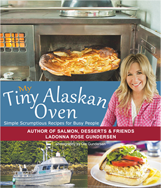 My Tiny Alaskan Oven is also more than just a cookbook. It’s a travelogue and with lively stories about Alaska and the commercial fishing lifestyle accompanied by gorgeous full-color photographs taken by Ole of the dishes, fishing and Alaskan scenery. “If I could give this cookbook 10 stars I would! Oh my goodness! I stumbled across this cookbook in a bookshop in Ketchikan. Usually there are 4 or 5 recipes that I want to try. Just got home a couple days ago and made the rhubarb lemon muffins! Wonderful! I have about 25 more that I want to try. Just wish I could have met Ladonna, but the book store owner told me she was out on the boat! The pictures are beautiful, both of the recipes and of Alaska. I need a couple more for gifts!” Marilyn U.